Conceived as a principal leadership development initiative at venn2015, APC went on to catalyse what became Global School Leaders (GSL) Malaysia, which is championed by APC member, Kathleen Chew (YTL Foundation), and with support from APC member, Chew Kwee San (Tan Chin Tuan Foundation), and partner, Hap Seng Consolidated Berhad. If it takes a village to raise a child, then bringing up GSL Malaysia has been the focus and efforts of hearts and minds spanning countries, communities, multiple disciplines, and government support to prepare the pioneering batch of 25 schools and 75 school leaders to start their 2-year commitment to the GSL pilot programme. APC’s first steps in framing an approach to improve public school education demanded expertise and experience for school leader training not yet available in Malaysia. A search for suitable existing models led to the streets and alleyways of New Delhi, to see on the ground the success of the Indian School Leadership Institute (ISLI) programme, which forms the backbone of the GSL model. ISLI’s track record in sustained school leadership performance, effective teaching and increased student learning objectives provided the right framework to adopt and adapt in Malaysia. Sharing a common vision for Malaysia (and beyond), APC partnered with GSL co-founders Sameer Sampat and Azad Oommen to establish GSL Malaysia, with Kathleen Chew’s stewardship and YTL Foundation as an incubator. The candidate search for the critical role of Country Director led to Teach for Malaysia alumni Cheryl Ann Fernando whose personal experience in transformative change while teaching at Sungai Petani, Kedah are documented in her book ‘T for Teacher’ and an award-winning movie ‘Adiwiraku’. Also critical was the securing of government support giving GSL Malaysia full access to any school in the Klang and Sentul districts. With GSL Malaysia set up as its own entity and programme managers, Ainu Shazwani and Shankara Kumaran completing the team, the programme was officially launched on 17 January 2018. From the first steps until the official launch by Deputy Minister for Education YB Dato’ P. Kamalanathan, bringing GSL Malaysia to the starting line has been a one and a half year effort. 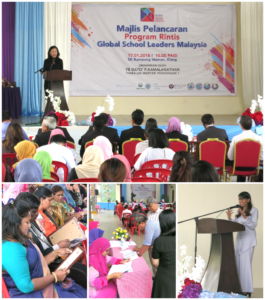 Success for GSL Malaysia is now down to the delivery of the programmes. With a strong team, a full complement of schools on board, school leaders will train in monthly workshops and customised coaching sessions to increase their leadership skills and improve overall school performance. By the end of 2019, the objective of the pilot is to show significant impact and gain continued Ministry of Education support (and eventual adoption) for the programme in alignment with the needs of local government schools.